We’ve embarked on some memorable culinary adventures in Hong Kong this week, where it’s been said that great food is a birthright. And as for the pinball machine metaphor, we’ve eaten delicious food in all sorts of places: from food stalls to cafes to the most upscale restaurants (a lavish dinner buffet at the Verandah restaurant at The Peninsula was mind-boggling). Some of the memorable dishes on our trip: tea-smoked duck, sashimi, dim sum, Indian curry, and The Pen’s mango soufflé and housemade chocolates (more on that in a later post). Another standout was the crispy roast goose and roast pork at Kam’s Roast Goose (甘牌燒鵝) on Hennessy Road on Hong Kong Island — a Star Ferry ride from our home base in Kowloon. 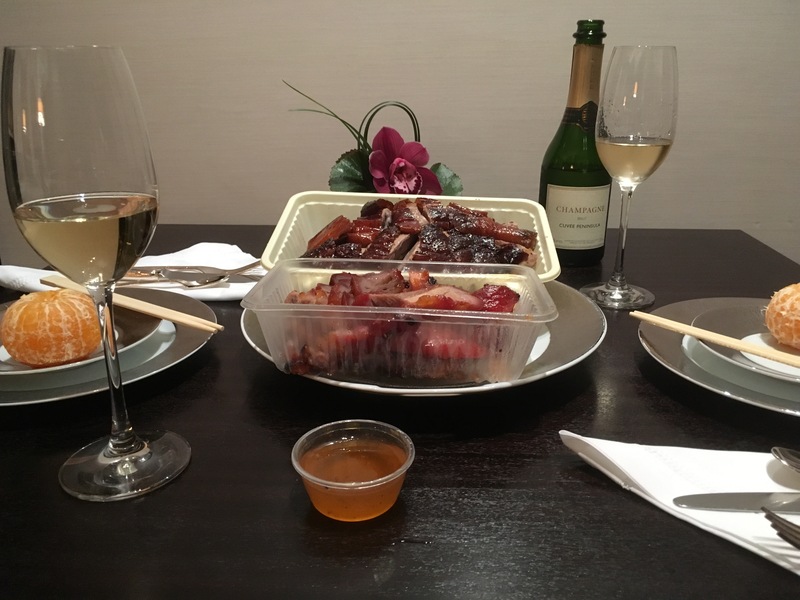 Hongkongers enjoy goose for its crispy skin and tender, juicy flesh — and Kam’s is a standout. Kam’s is a modest, “no-frills” 30-seat restaurant on a bustling street, much like the eateries that are ubiquitous in San Francisco’s Chinatown — except that Kam’s is the winner of a coveted Michelin star. (For comparison’s sake, Michael Mina in San Francisco — where “the caviar parfait never goes out of style” — also is a Michelin one-star restaurant). 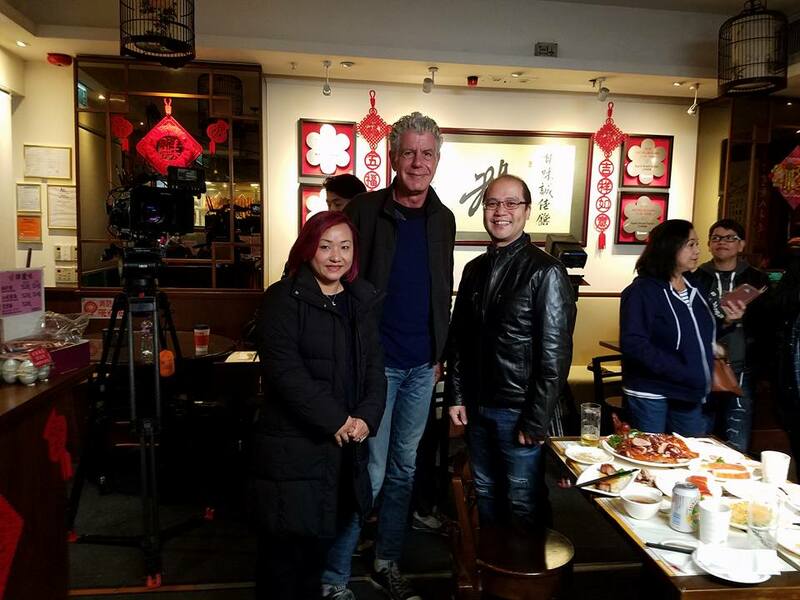 Added the South China Morning Post: “One of the grandsons of Yung Kee founder, Hardy Kam Shun-yuen opened the restaurant to serve quality roast goose in a casual setting with rice or rice noodles, either thick (lai fun) or thin (mai fun). The geese are freshly delivered every morning and roasted in a gas oven instead of the traditional charcoal way. The day’s roasted meats are displayed in the window. We were prepared for a “queue” when we arrived, but not for one that was over an hour wait. So we ordered takeout and brought it back to our hotel room. Kam’s takeout is a popular with locals. We served ours with a split of The Peninsula’s “house” champagne. (The house champagne is an amazing Deutz Brut Classic). 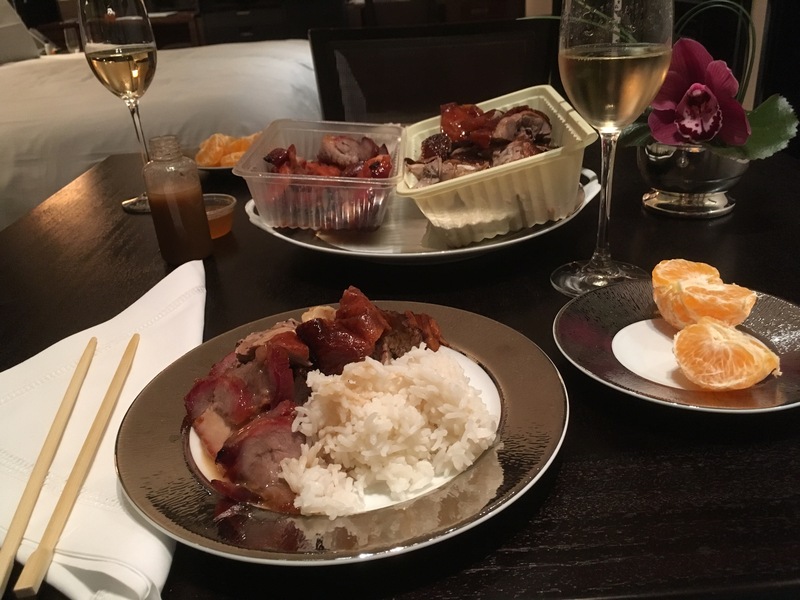 The goose and pork is crispy on the outside with juicy meat on the inside. It comes with a house-made special sauce (which includes secret spices and bean paste) as well as a fruity plum sauce for dipping.